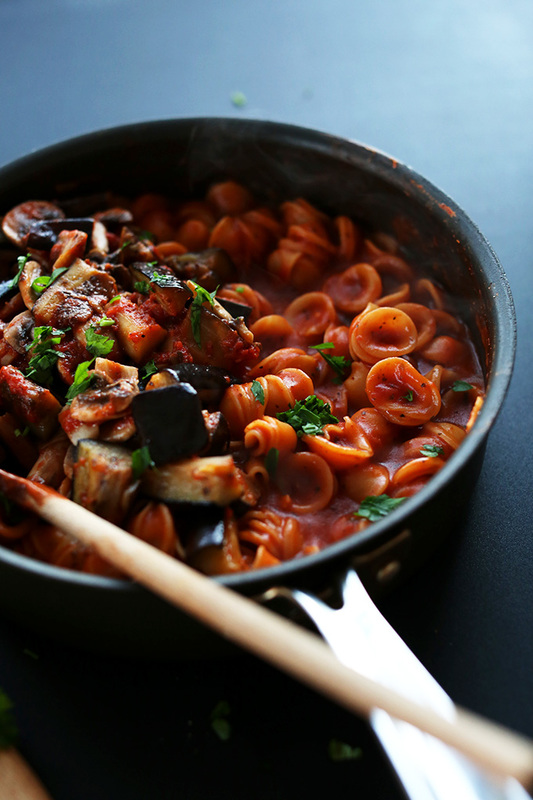 One Pot Vegan Pasta – No boiling water required – just throw it all in and cook! Plus, packed with healthy veggies and bold tomato flavor. Tom Kha “Gai” Butternut Squash Soup – Tom Kha Gai without the gai (chicken)! 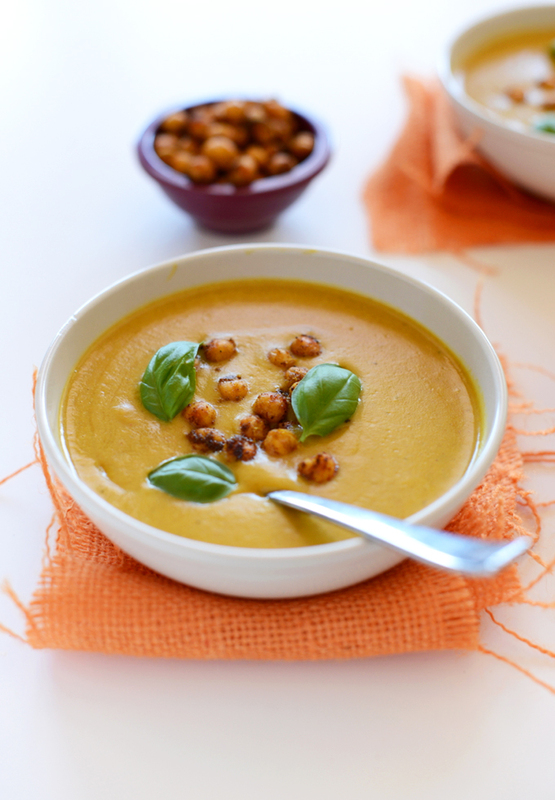 A vegan and gluten free soup with tons of flavor and health perks. 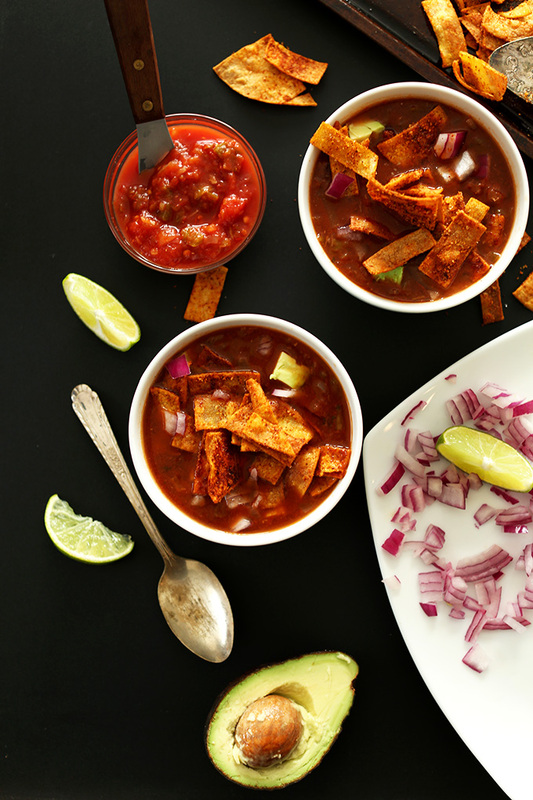 Loaded Veggie Nacho Soup – Nachos in soup form, topped with DIY Chili Cheese Fritos! 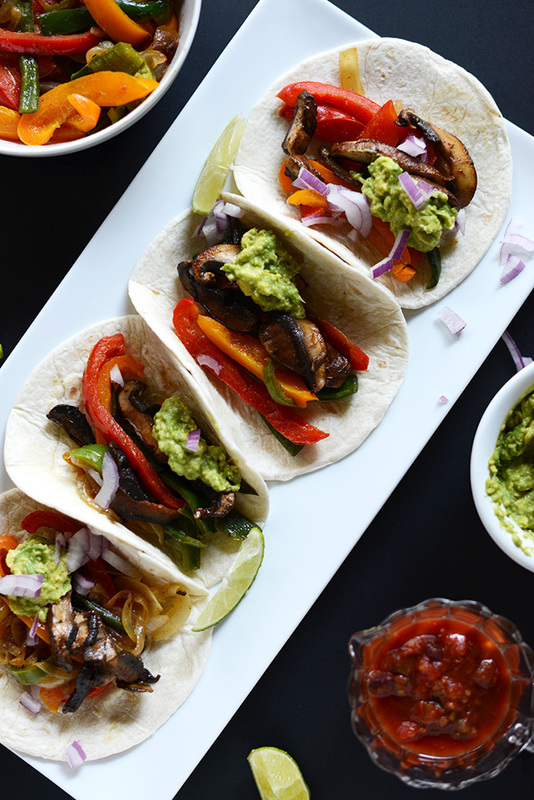 Poblano and Portobello Fajitas – Fajita lovers will love this meatless version featuring hearty portobello mushrooms and poblano peppers. Quick, easy and so healthy. 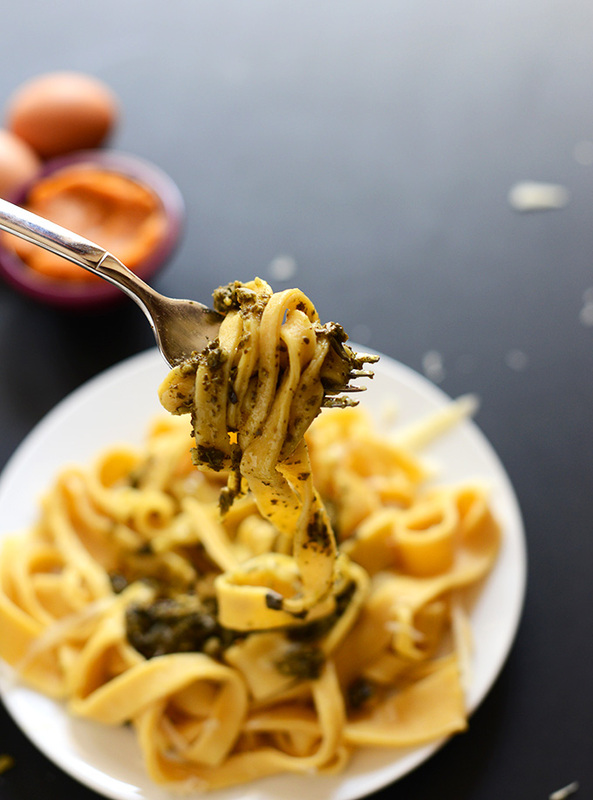 Homemade Pumpkin Pasta with Basil Pesto – Simple homemade pasta made with pumpkin, flour, eggs and salt and tossed in basil pesto. 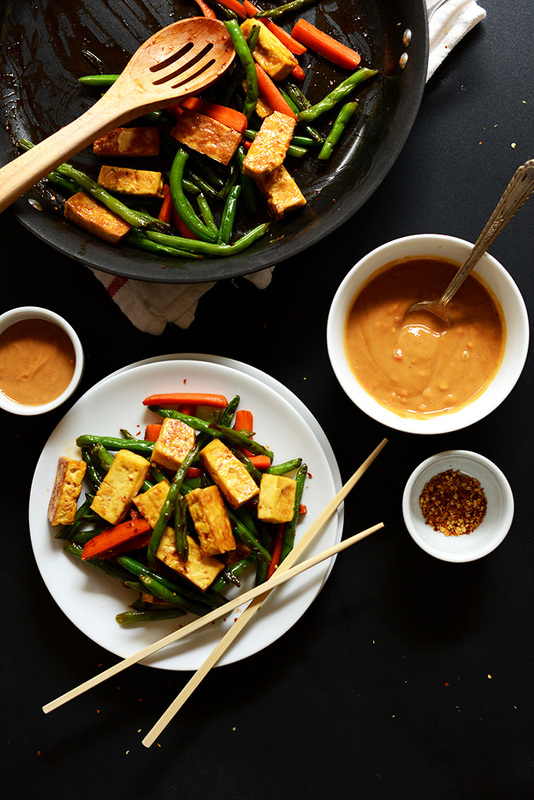 Tofu That Tastes Good: Easy Stirfry – My favorite way to prepare tofu – it’s quick, it’s healthy, it’s baked and then tossed in a simple, flavorful glaze! 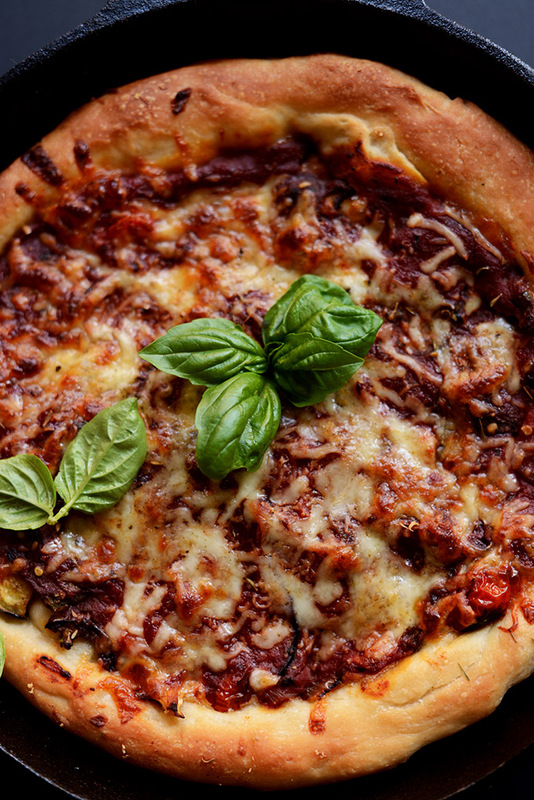 Simple Deep Dish Pizza – Deep dish pizza without the hassle. Forty-five minutes, no butter and no mess required. 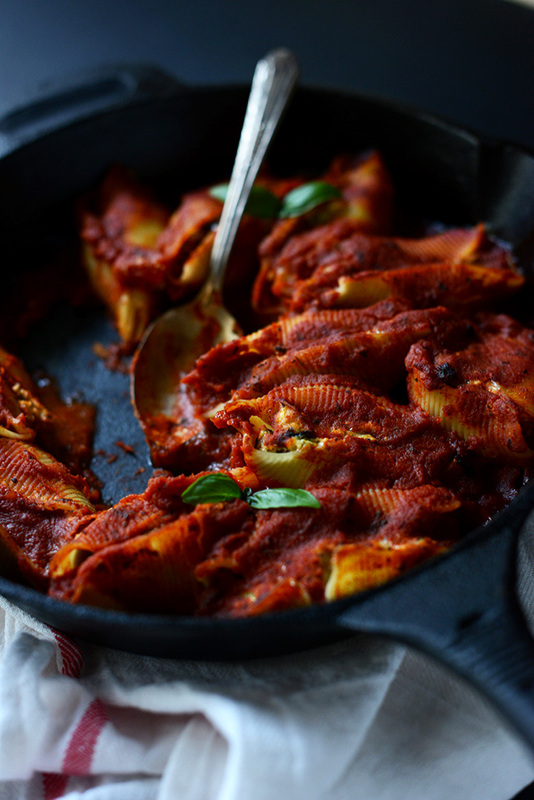 Dairy Free Stuffed Shells – If you love stuffed shells you’ll love this dairy-free version that’s packed with roasted eggplant and basil pesto. 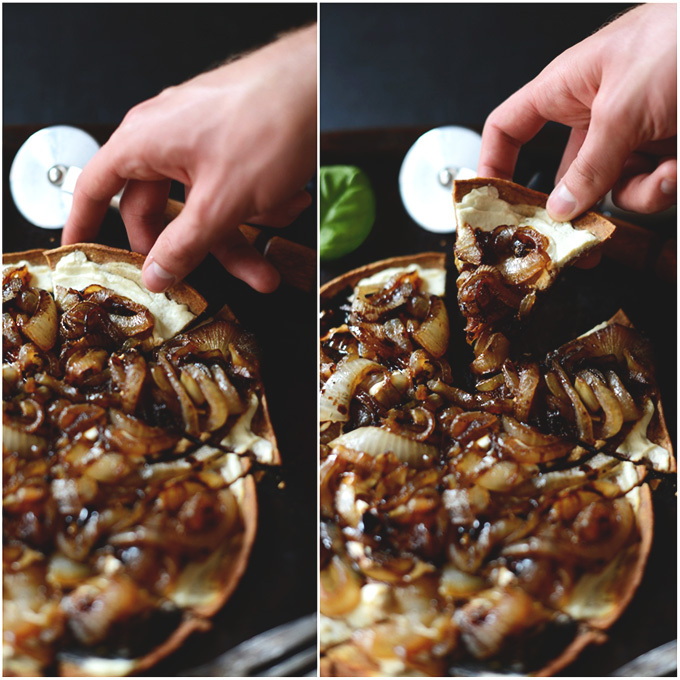 Goat Cheese and Caramelized Onion Pizza – A 30-minute pizza that’s LOADED with big flavors thanks to goat cheese, caramelized onions and a balsamic reduction. Black Bean, Green Chili and Manchego Enchiladas – Fast, healthy, spicy, filling. 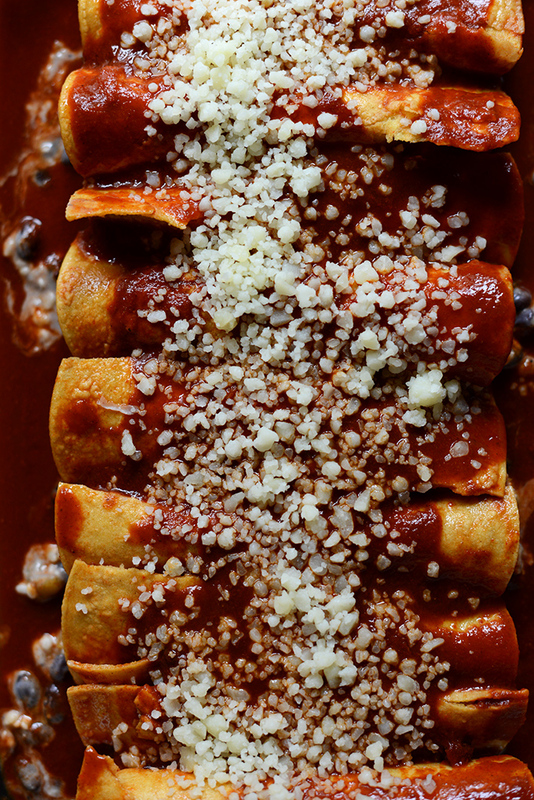 It doesn’t get any better than these spicy black bean enchiladas. 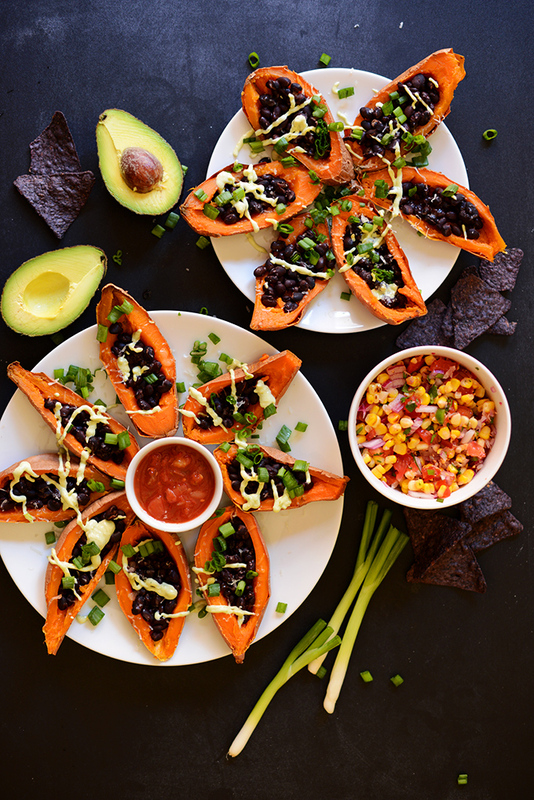 Loaded Black Bean Sweet Potato Boats – Sweet potatoes get an upgrade with black beans, salsa, shredded cheese and a homemade avocado crema! Easy Noodle Free Pad Thai – Pad thai without the noodles! Fresh, healthy and packed with flavor. 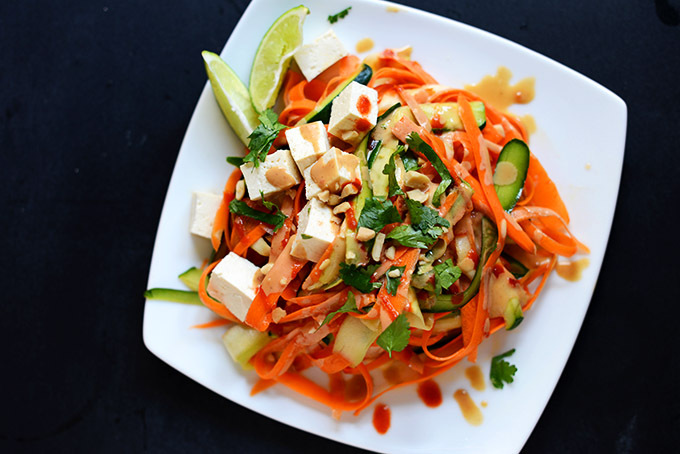 Top with peanut sauce and your tastebuds will be in heaven. 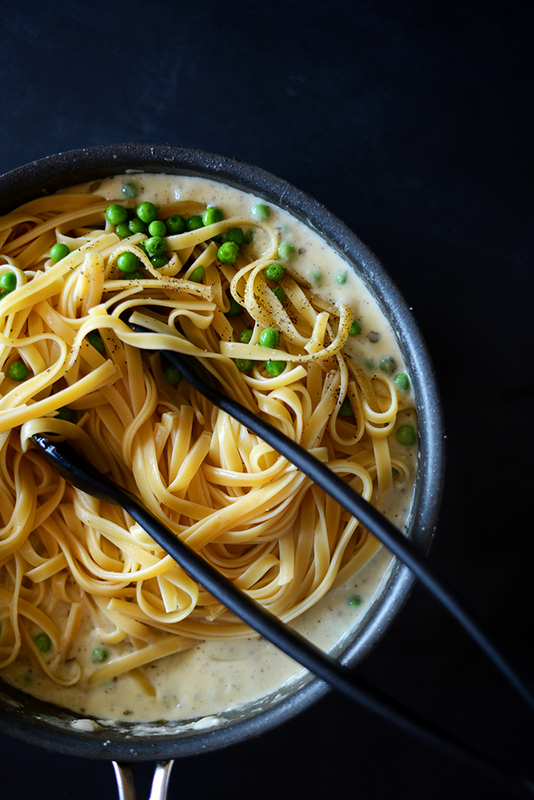 Butter-Less Alfredo with Peas – My go-to butter-free alfredo sauce that’s loaded with flavor and extremely customizable! Make it spicy, pick your favorite cheese, or make it as I suggest – packed with basil pesto and Parmesan cheese. 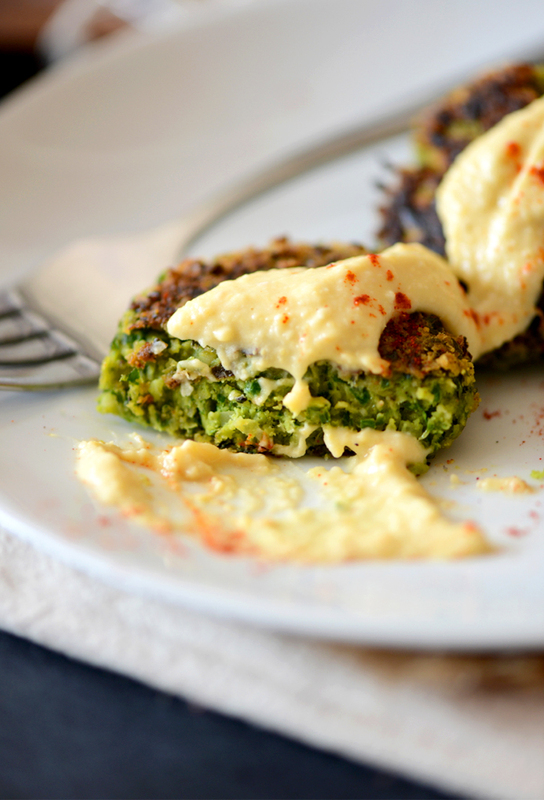 Better Than Restaurant Vegan, GF Falafel – Truly better than restaurant falafel because it’s loaded with big flavors but sauted and not fried! Healthy, simple and so satisfying. 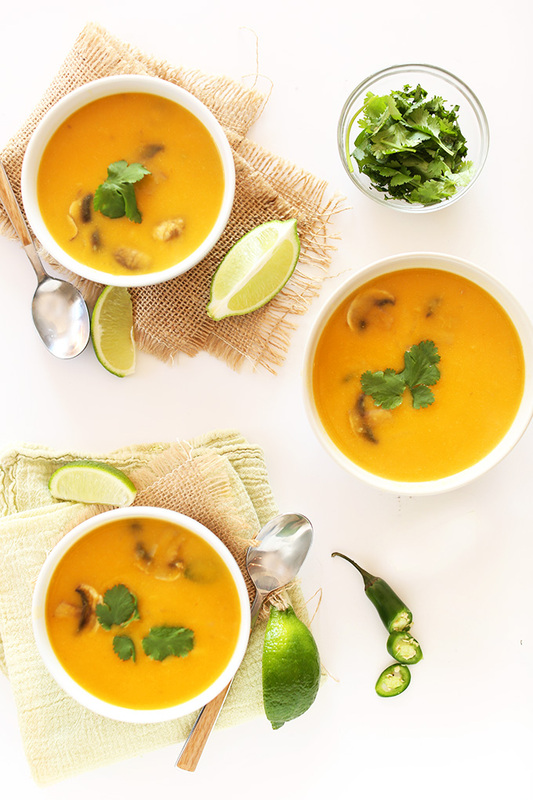 Sweet Potato Coconut Curry Soup – Curry soup with a sweet potato makeover. Sweet, spicy, coconut-y – simply heavenly. And never run out of healthy, easy dinner ideas again! Dana- January of 2017 marked a huge lifestyle change for me where I adopted a plants-based Whole Foods diet in order to put my crippling and painful rheumatoid arthritis into remission and avoid quality-of life decimating drugs and steroids. Somehow we eventually stumbled into your blog and began to try your recipes one by one. Each a hit, each a favorite…leaving me more than grateful to you for making this huge change more of a delightful journey of exploring real food verses a deprived sacrifice of being constantly hungry and unsatisfied. I want all of your books, everything you’be got, keep it coming!!! I’m constantly telling people to just use your website as a one stop shop, no need to go further. Some listen and some don’t, and man I get so frustrated with the matter. You make it so easy! Ahhh! Oh man, how can I eat all of these at once? I love your recipes! Your recipes look amazing:) Our family is transitioning to a vegetarian lifestyle and I can’t wait to try these. Thank you for sharing! Wonderful! Hope you love them, Dona! We are in love with your 31 meals cookbook! Awesome recipes for everyday and when company is coming. Thanks so much! So great! Thanks for sharing Terri!